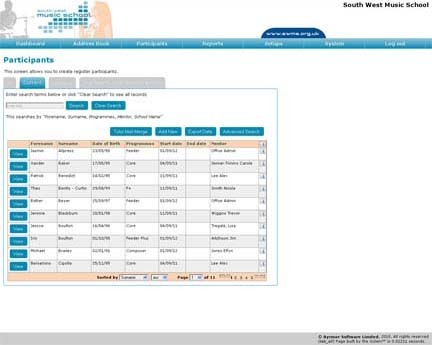 We developed a bespoke database application for South West Music School four years ago and have supported it since the initial implementation. We have recently updated the system using our latest codebase and introduced a number of new features that will address problems that have arisen since the system was first launched. The bespoke database application enables staff, partners and mentors to view and edit records associated with each of the participants. Although the application is fairly simple, it became apparent that the staff needed to export data collected, so that it could then be used outside of the system for a variety of administrative tasks. The updated system provides staff with the facility to extract data far more efficiently than before, as well as providing them with some additional reports that can be used to draw of specific information. We completed the development work during August and sent across a questionnaire about the project (see below). Q: What was your initial problem / reason for approaching Ayrmer Software? A: The database needed updating to the latest codebase to enable us to interact with it in a more useful way for our needs. Q: How did you find the initial discussions with us? Q: Do you feel that we provided you with alternative solutions? Q: What reason did you decide to commence the project with us? A: Ayrmer Software set up the database initially and know who we are and what we need. Q: Did you feel that when we started development we had provided you with enough information, written or otherwise, for you to have a clear idea of what was going to be achieved? Q: Do you feel that the project met your requirements? Q: If so, how did the project solve your initial problem? A: It is now much more user friendly and enables us to pull off CSV [Comma Separated Values] files which we can manipulate and use the data more efficiently. Q: Was any post development support conducted in a timely and helpful manner? Q: Could you describe the effect the project has had on the way you work? A: It makes the database much more useful and decreases the number of other places we have to keep data in order to be able to use it. Q: Any further comments, feedback or suggestions? A: You are wonderful as ever! If you want to find out more about how Ayrmer Software can help with improve your bespoke database applications please contact us on 01249 566017 or email sales@ayrmer.co.uk.